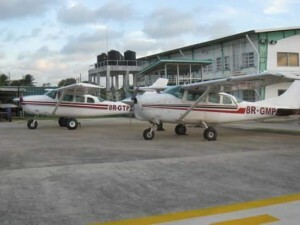 An inquiry has been launched into the unauthorized departure of two light aircraft from the Eugene F. Correia (Ogle) International Airport almost one week ago, Minister of State Joseph Harmon said Thursday. He said Minister of Public Infrastructure, David Patterson advised Cabinet that an inquiry has been launched as part of government’s efforts to ensure there is no repeat of such an incident at an international airport. “There are very serious matters in relation to security and the fact that the Eugene F. Correia Airport is an international airport, that makes it even more important to ensure that our security procedures are tightened,” he said. The probe would seek to determine who was involved and recommend steps to ensure that such an incident does not recur. The owner of Oxford Airways, Munidat ‘Raj’ Persaud and another man flew out the Cessna 206 planes without customs, immigration or air traffic approval. After flying through Trinidad and Tobago airspace, they landed on Grenada and Anguilla. Anguillan authorities then only gave approval for one of the planes to leave for San Juan, Puerto Rico. The aircraft were flown out of Guyana despite a High Court injunction pending the hearing and determination of a lawsuit related to the alleged damage of a Domestic Airlines’ plane at Ekereku by one of Oxford’s planes. The management of Ogle Airport Inc. has confirmed that the planes left without the required approvals. Persaud owns a flight school and operates a charter service in the US.